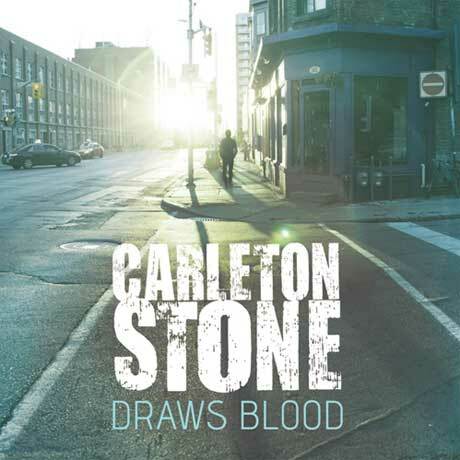 Having released his debut album, Carleton Stone Drives the Big Wheel, back in 2009, as well as his self-titled LP two years later, it's easy to see that Nova Scotia-bred singer-songwriter Carleton Stone bleeds for his art. Nowhere is this more evident than on the Canadian crooner's newest LP, Draws Blood, which sees its release on March 4 via Groundswell/Warner. Stream the album now in the player below. Co-produced by Broken Social Scene alumnus Jason Collett and acclaimed producer Howie Beck (Feist, Hannah Georgas), Draws Blood finds the East Coast musician moving towards a more expansive sonic palette, evoking Low-era David Bowie and Andy Summers' riffs ("Climbing up the Walls"), yacht-rock grooves ("Blood Is Thicker Than Water") and anthemic '80s pop (the album's clap-heavy title-track). On the lyrical front, a press release notes the album acts as a tribute to fallen guitarist — and Stone's first-ever co-writing partner — Jay Smith, who passed away while on tour with Matt Mays back in 2013. "Draws Blood is about what we lose in life and the way we hold ourselves as we carry this pain forward, still trying to find the joy that makes every day worth living," Stone said in a statement about the album. Hear for yourself by listening to Draws Blood in its entirety, which you can find underneath Stone's upcoming tour itinerary with fellow Maritime musician Matt Andersen.